From the leaflet of Great People of Kanazawa Memorial Museum. After looking at two exhibitions and having lunch at the 21st Century Museum of Contemporary Art, Kanazawa, on July 22, my wife and I visited Great People of Kanazawa Memorial Museum  nearby. The Memorial Museum displays the materials of the following persons born or grown up in Kanazawa: (from left to right in the upper row of the photos in the image) Yoshiro Taniguchi, architect (1904-1979); Jokichi Takamine (1854-1922), chemist; Setsurei Miyake, critic (1860-1945); (in the middle row) Godo Nakanishi, conservationist and poet (1895-1984); Toho Fujioka, scholar on Japanese literature (1870-1910); (in the bottom row) Yoichi Hatta, civil engineer (1886-1942); Daisetsu Suzuki, scholar on Buddhism (1870-1966); Hisashi Kimura, astronomer (1870-1943). The building of the museum consists of three floors. On the first floor, materials of Taniguchi, Nakanishi and Hatta are shown; and on the second floor, those of the other five persons. The third floor has a hall and a lecture room. I was especially interested in the materials of Takamine, because I was one of the recipients of the third Takamine Prize for high school students  (now personal recipients are chosen from junior high school students, and a group prize is provided for junior high schools). Though it was one of summer holidays, there were no other visitors while we were in the Memorial Museum. It would be highly desirable to let children visit such a place in order to know the life and work of the great people and have dream and ambition, as written in the leaflet of the museum. There are respective memorial museums at other sites for the three writers born in Kanazawa: Izumi Kyoka (1873-1939), Tokuda Shusei (1871-1943) and Murou Saisei (1889-1962) [3-5]. Web site, Great People of Kanazawa Memorial Museum (in Japanese). 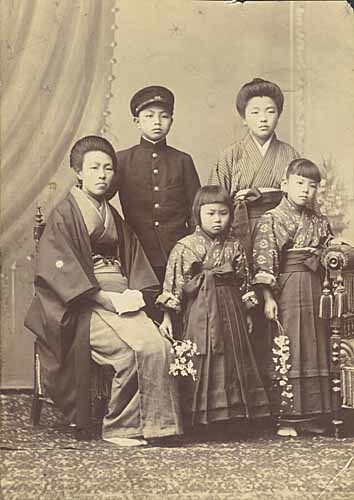 Web site, Dr. Takamine Jokichi Memorial Foundation (in Japanese). Web site, Izumi Kyoka Kinenkan Museum (in Japanese). Web site, Tokuda Shusei Kinenkan Museum (in Japanese). 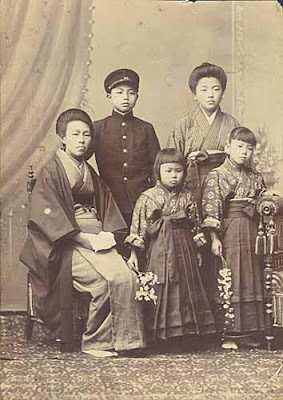 Web site, Murou Saisei Kinenkan Museum (in Japanese). The 21st Century Museum of Contemporary Art, Kanazawa. I first visited the 21st Century Museum of Contemporary Art, Kanazawa, (see the above photo) just after a week of its opening on October 9, 2004. Last Friday (July 22, 2005) I made the second visit there with my wife. The outermost walls of the first floor of this museum form a circle with a diameter of 112.5 m. This form makes it possible to explore the museum from all directions . There we looked at two exhibitions: "Drawing Restraint: Matthew Barney" and "Another Story: Selected Works from the Collection." Barney's exhibition was the sum of his rather strange drawings (for example, a self-portrait drawn on the ceiling by jumping on a trampoline), sculptures, photographs and a film (expressing an abstract story suggesting a repeated rebirth and collapse by the use of images of whaling and the tea ceremony). The purpose of "Another Story" was to show part of the diversity of the event, pattern of human perception and sense value in the world. I found Carsten Nicolai's work entitled "Milk" interesting. It consisted of 10 monochromatic photographs, which captured the surface patterns of milk in a tray shaken by different frequencies from 10 to 110 Hz. Soft hemispheres constituting the patterns singly or in aggregate made me think of the source of milk, i.e., breasts. 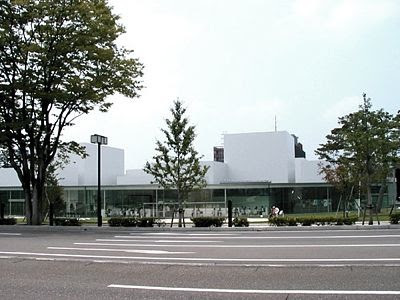 Web site "21st Century Museum of Contemporary Art, Kanazawa". Japan's first fountain built in 1861. 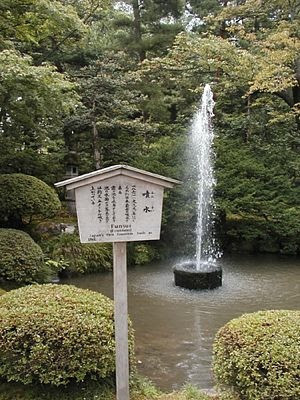 The fountain in Kenroku Park (see the photo) is associated with a special memory of mine. One of my brothers, who was senior to me by six years and died at the age of 9, left an unfinished drawing of that fountain. I kept it until I was of the same age as he had been at his death. So, every time when I visit Kenroku Park these years, I go to see this fountain. Last Friday, my wife and I passed through Kenroku Park to go to the 21st Century Museum of Contemporary Art, Kanazawa, and saw that fountain on our way. I did not remember what was written on the bulletin board at the side of the fountain, but it reads as follows ("Kasumiga-ike" in the quotation is a large pond in Kenroku Park). Fountain: Having been built in 1861, this is the oldest fountain in Japan. Its water source is Kasumiga-ike, and a head of water makes the height of jet about 3.5 m.
The above is my translation from Japanese words on the bulletin board; English words there simply read: "Funsui (Fountain); Japan's first fountain built in 1861." I made a small trip to Kanazawa and Yamashiro Spa from the 21st to 23rd of July with my wife. On the first day in Kanazawa we visited our ancestors' graves on Mt. Noda and at temples in Tera-machi and No-machi. Across just the inside of one of entrances, which we have been using, to the graveyard of Mt. Noda, the construction works of a wide car road were in progress. What will be the method of pedestrians' crossing over the road? At least some of the visitors to the graveyard would suffer much inconvenience. In the morning of the second day we took a loop bus from the JR Kanazawa Station to an entrance of Kenroku Park. The entrance is near Ishikawa Gate (the photo) of Kanazawa Castle. We walked Kenroku Park a little and went to the 21st Century Museum of Contemporary Art, Kanazawa. The site of Kanazawa Castle was used by the army from 1871 to the end of the 2nd World War, and then by Kanazawa University from 1949. 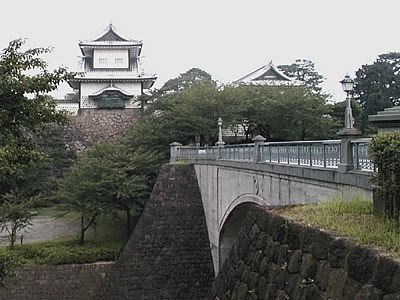 Ishikawa Gate, which was both the symbol of the destroyed castle and the entrance of the university, was designated as an important national cultural asset in 1950. However, the university campus moved out of the castle site during 1978 to 1995. After the completion of the relocation of the university, the castle site was rearranged to become the Kanazawa Castle Park . Thus the bridge (Ishikawa-bashi) seen in the photo in front of Ishikawa Gate now connects the two parks, Kenroku Park and Kanazawa Castle Park. Some more story of our trip will be described later. In 1952 I was a second year student of a senior high school in Kanazawa. One day the teacher of our physics class took us out to a nearby transformer substation to look at equipment there. Then the teacher took a photo of us. I am the third person from left in the second row. 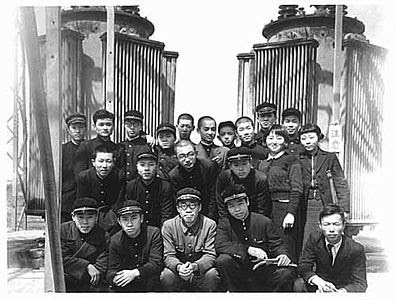 The rightmost person in the front row is probably the head of the substation. Note that the ratio of the number of boys to that of girls in the physics class was 9 to 1, although the total number of boys in the school was nearly the same as that of girls. 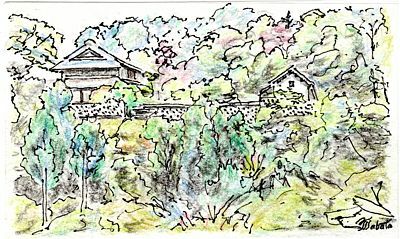 A sketch from the restaurant Santoka in Chihaya-akasaka Village. The building at the upper left is the residence of the owner of the restaurant. On the right, the side of the roofed, white gate of the residence is seen. Yesterday (July 2, Saturday) my wife and I joined the one-day group trip organized by a travel agency. We got on a bus in front of the JR Ten'noji Station. The number of the group members was 35. We first visited Enmeiji Temple in Kawachi-nagano. There is a lotus pond in the garden of the temple, where we saw no flowers but some buds. It is a good place to visit in autumn, because there are many maple trees, among which the largest is about one thousand years old. That one has the name yubae-no-kaede (maple beautiful in the evening sun). Then we went to Chihaya-akasaka Village. This is an only single village in Osaka Prefecture. The destination of our trip was the restaurant Santoka  at the foot of a mountain. The owner of the restaurant and his families has been living there since the days of their ancestors, who made a living by forestry. Now the part of the land around the restaurant is one of the most famous spots to see rhododendrons and hydrangeas. After having a fancy dish for lunch, we walked along the mountain roads to look at flowers of hydrangeas and other plants. It had been raining rather hard until we finished lunch. In the afternoon, the rain became less hard, so that we could enjoy walking rather comfortably by breathing cool air of a forest. I did not brought with me tools for sketching. 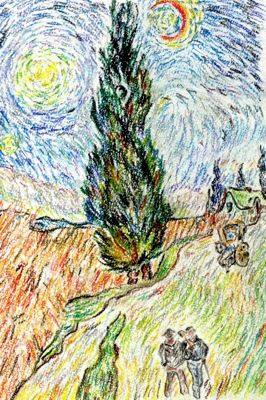 However, I made the sketch shown above after lunch by the use of a pencil and a sheet of pocket paper, on which sweet stuff had been served together with a cup of Japanese tea. I completed the sketch with a pen and color pencils after coming back home. Web site, Santoka (in Japanese). at the top of Mt. Goro, Maizuru, Kyoto. On Sunday, we arrived at the JR Fukuchiyama Station in the early afternoon, and visited Fukuchiyama Castle. The castle was originally built by Mitsuhide Akechi around 1580, but was destroyed in Meiji Era except for stonewalls. The present castle tower was reconstructed in 1986. Then we walked on Otonase Bridge over the Yura river to go to Sandan-ike Park. We were surprised to see that there was no water in Sandan Pond. Leveling of the ground was proceeding to make a playground there. I wonder if it is a good plan to destroy a big pond and accordingly the ecological system of Sandan-ike Park filled with many plants and creatures. The place of our stay at two nights was located at the top of Mt. Goro in Maizuru. From the window of our room, we had a fine view of Maizuru Bay, and I made a sketch of it. The sketch of the next morning and that of the morning after next show views further to left (west). 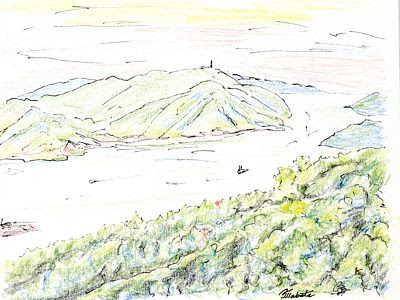 The mountain at the center of the last sketch is Mt. Tatebe, which is also called Tango-Fuji because of its shape similar to Mt. Fuji. On Monday, we arrived at the JR Maizuru Station rather late in the morning. So we hurried to Ayabe Friendly Ranch to have lunch at a restaurant there. We saw Yura River again on our way there. Walking for 40 minutes or so in the foot of Mt. Takashiro, we lost a way and asked a countryman the way to the ranch. He told us that there was no ranch there any more and that it was being converted to a site of a riding club. Alas! Anyway, we had to go to the old ranch. Leveling of the ground was also in progress there. Luckily, there remained a restaurant, so that we were able to have lunch there. Coming back from the old ranch along a path through rice fields, we saw a small scoop wheel and a field of irises in full bloom. The scoop wheel seems to have been constructed for sightseers by drawing its model from those that actually helped agricultural laborers in old days. In the morning of Tuesday, we walked near the JR Higashi-maizuru Station to see Kitasui Railway Tunnel, the Maizuru City Commemoration Hall and the World Brick Museum. All these brick constructions, now preserved as cultural heritages, were originally built for the former Japan Navy. Looking at them, I thought that we should never make such buildings for war again. Then We Couldn’t Have Been Your Pupils! The reunion of our class at the former Ishibiki Elementary School in Kanazawa was held at the Japanese style hotel Takitei in Kanazawa Saikawakyo Spa from the evening of June 2 to the morning of June 3, 2005. Participants were our teacher Mr. A and his wife, 16 class OGs including Prof. H.I. from USA and her younger sister to help her travel, and nine OBs including myself; a total of 27 people. The number of pupils in our class was 61. Among them six OBs died already. The party of the reunion took place from 6:00 pm to 8:00 pm. We were seated along the three lines of tables put in the shape of the Greek capital pi, with Mr. A at the center of the shorter line. Mrs. A who has a problem at her knees took a seat at the corner of one of the two long sides. The other particiants' seats were determined by drawing. The organizer in chief, Y.T., presided the party. He explained that this reunion celebrated Mr. A's age of 80 (actually he is now 83 years old) and ours of 70, and then asked Mr. A to give a short talk. Mr. A began saying, "I came to Ishibiki Elementary School just after you finished it." Some OGs and OBs said, "Oh, no! Then we couldn't have been your pupils!" "It's wrong!" "Let's say for his honor, 'Mr. A is quite right.' " and so on. Does Mr. A have Alzheimer's disease? No, that was a slip of the tongue. He wanted to say, "I left Ishibiki Elementary School soon after you finished it." Thus the reunion started with a big laughter, and merry mood continued all through the party and a party after party, which ended at 11:00 pm. It was an experience like a time slip into elementary school days. At the party after party, H.I. told me that she had had the disaster of losing the memory of her lap-top computer by exposing it to X-ray inspection at an airport. On June 5, I called her at her mother's house in Takarazuka to ask if I could help her with her computer. However, it seemed that I could have nothing to do, because she had lost only document files and because she had back-up files back in USA. Wishing to get a copy of her publication some day, I sent her the book "Kagami-no Naka-no Hidarikiki (A Left-Hander in a Mirror)," in which I had written a comment of twenty pages. The photo shows the entrance of the Hotel Takitei in Kanazawa Saikawakyo Spa, where the reunion of our elementary school class was held (taken June 3, 2005). Click on the image to see the real size one. For some days after getting the announcement of the reunion of our class at the former Ishibiki Elementary School in Kanazawa, I was unable to decide whether I should attend it or not. It was because I saw some of my classmates on the occasion of the reunion of the same year classes of that elementary school held last autumn, and because I visited our teacher, Mr. A., last summer. So I sent an e-mail message to one of my classmates and good rival, Prof. H.I., who works at the University of California at Santa Barbara, to ask if she would attend the reunion this time. But, alas, the next day I found that the message had not reached H.I. Then, I made the search of her name on the Internet and learned her new e-mail address from the home page of the university. Her name on the home page newly had the initial of the middle name "G." So, I wrote her not only the question about her possibility of participation in the reunion but also the guess that her middle name came from her nickname in elementary school days. Her nickname given by some boys in our class was Gacha, meaning an "unattractive look" in the dialect of Kanazawa, and she admitted it as her nickname. So I supposed she adopted it as her middle name from the sense of humor. H.I. wrote me back promptly, "I am planning to attend the reunion with my sister. My middle name comes from my mother's maiden name!" Her planning of attending helped my decision to do the same, but I was ashamed to think that my guess might have been rude to her. For the sake of her honor, I have to write here that I do not think her look unattractive. 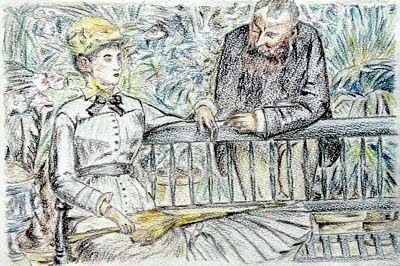 Sure, she is not such a woman as is regarded as beautiful by men's average standard, but her look filled with strong will, high intelligence and good health is a different kind of excellent beauty. Yesterday I received a wedding invitation from India by e-mail. The e-mail message of invitation had an attachment of a PDF file, in which an announcement was written in English and Indian. This was the second time to get such an invitation from India, so that I was not surprised at all this time. Indians seem to have the habit of sending wedding invitation to all their friends and acquaintances. The first time I received a wedding invitation from India was on the occasion of the marriage of a brother of a friend of mine, Indra, in April 2001. Indra lives in U.S.A., and the invitation was sent by a relative of his by postal mail from India. I told Indra about my getting the invitation, and he was rather surprised, too. The invitation I got yesterday was from a young scientist, who now studies at a university in Korea. Formerly he had wanted to study in Japan, found my home page, and written me by e-mail some years ago. Then he and I became friends, and he got some samples of the experiment for his thesis irradiated by gamma rays at my former work place. However, we have never met yet. I sent him an e-mail letter of congratulations together with a photo I took of cherry blossoms just beginning to bloom. I like a fine day. 'cause I love you so deeply. A young friend of mine, Yoro, is running a small company to make and sell CDs in Ebetsu, Hokkaido. Last week I ordered him a CD  made in China and sold by his company. It is a collection of serenades played by Zhu Changyao with an erhu by the accompaniment of the Orchestra of the Music and Dance Troop of Jiangsu Province of China. Zhu Changyao is a popular Chinese erhu virtuoso and composer. The erhu is a traditional Chinese string instrument with two strings. The CD arrived this afternoon. It includes "English Serenade," Schumann's "Traumerei," Dvorak's "Humoresque," Schubert's "Lullaby," De Curtis's "Come Back to Sorrento," Brahms's "Lullaby," etc. Listening to those well-known pieces of music played with an erhu in quiet and nostalgic tone, my heart, being hurt by dark pieces of news these days, was much soothed and warmed, though it was terribly cold today. "Zhu Changyao's Art of Erhu No. 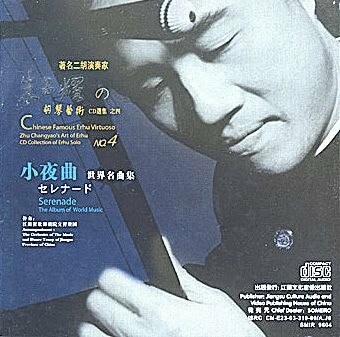 4: Serenade" (Jiangsu Culture Audio and Video Publishing House, China; sold by Booxbox).